Welcome to CrossFit Liberate! We strive to improve the overall wellness of our community by focusing on fitness, nutrition and fun. Simply put, we are committed to offering the benefits of CrossFit to everyone in our community, regardless of previous athletic background or ability. Centrally located in downtown Athens, our brand new 6,500 square foot facility is a clean and expansive space ready for your fitness journey. Join any of our classes, or work one-on-one with any of our dedicated and experienced coaches. We pride ourselves on great customer service, professionalism, and accessibility. One visit and you'll understand why we love to call CrossFit Liberate our second home! Yes, I’d love a FREE class! CrossFit Liberate’s brand-new 6,500-square-foot facility is downtown Athens’ premier place for fun and fellowship through fitness. You’ll love our rustic brick interior, complete with 35-foot bow-truss ceilings, a turf room, on-site childcare (offered at no extra cost with membership! )—and tons of character. From our welcoming front desk to our well-maintained and inviting gym space, you’ll enjoy well-kept equipment coupled with our knowledgeable, approachable, and friendly staff. Join us for classes, and you’ll meet CrossFitters of all ages and skill levels—plus some of the area’s most welcoming coaches. Step inside our box and find out why you’ll never look back. Can I add more stars? Because I love it. I’ve never met more welcoming and helpful coaches and athletes than I have at CrossFit Liberate. I started CrossFit two months ago and going to CrossFit is already so addictive (even at 6am). Why? Because coaches and people are definitively amazing!! I am learning, challenged, getting fitter and stronger everyday! The CrossFit Liberate experience is also really complete with yoga, gymnastic classes etc... everything in the same facility. What else? 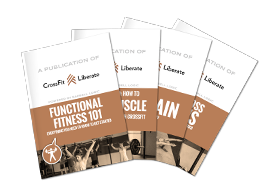 Just join the CrossFit Liberate community!! Couldn’t have asked for anything better: learning CrossFit directly in the US with wonderful, but also really competent people, ready to share experiences, tips and advices.